For 38 years, The Chicago School has been an innovator of psychology and behavioral science. Our Chicago Campus is an accredited, not-for-profit institution that offers hands-on courses taught by world-class faculty. From counseling to organizational leadership, every degree program places a great emphasis on field experience and networking. Because The Chicago School focuses exclusively on psychology and related behavioral science fields, Chicago Campus students receive an unparalleled education. Chicago Campus graduates have gone on to work for organizations like North Shore Pediatric Therapy, YMCA of the USA, and the U.S. Department of Defense. Our in-depth, engaged approach prepares students for careers serving communities like Chicago and beyond. Our Chicago location is just steps away from Lake Michigan, the theatre district, the famed Magnificent Mile, dozens of museums, and some of the world’s top restaurants and clubs. Plus, there’s always an opportunity to grab some classic Chicago deep dish pizza. Sometimes described as a colorful “patchwork quilt” of diverse neighborhoods—including Greek, Chinese, Mexican, Swedish, Ukrainian, and more—Chicago provides a true multicultural environment for your educational training. The Commission on Accreditation of the American Psychological Association (APA) has reaccredited The Chicago School’s Psy.D. in Clinical Psychology program at our Chicago campus. Noting their appreciation in The Chicago School’s commitment “to develop and maintain the best possible quality of graduate education and training in psychology,” the APA has determined that The Chicago School’s Psy.D. program continues to align with their strict standards. At The Chicago School, we encourage students to stay engaged in the psychology and behavioral science communities. Some of the professional organizations that Chicago Campus students network with are the Illinois Association for Behavior Analysis, the Chicago Society for Human Resource Management, and the Illinois Psychological Association. We also believe that immersive, multicultural field experiences foster a community of engaged, diverse professionals. Chicago Campus students don’t just learn about what it means to be an engaged community member—they’re already making a meaningful difference in the city itself. Through hundreds of training prospects, Chicago students conduct research and assessments, provide counseling and clinical services, assist with developing and launching new programs, and participate in strategic planning efforts. Discover how our Chicago Campus students get involved in the greater Chicago community—and the world at large—here. 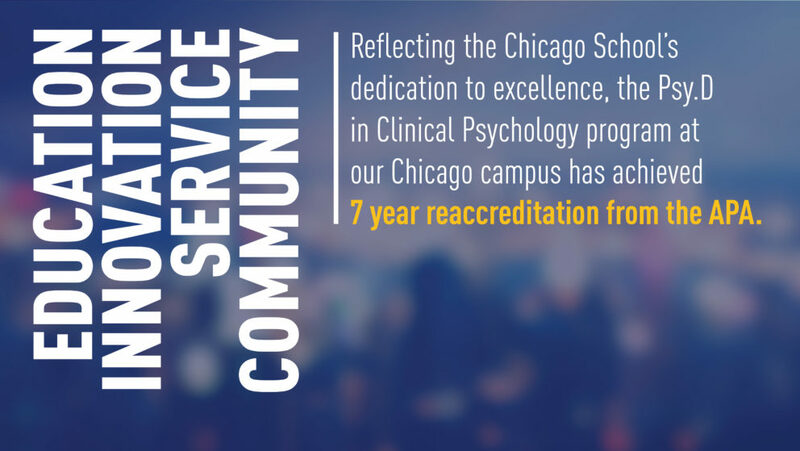 As one of the largest psychology-focused graduate schools in the Chicago area, our Chicago Campus offers a full continuum of graduate programs in relevant and quickly growing areas of psychology. Degrees are available at the master’s, education specialist, doctoral, or certificate level. From Ph.D. in Organizational Leadership to Psy.D. in Clinical Psychology, explore our full list of Chicago programs today. The Chicago School’s Chicago Campus also offers academic partnerships within the city. For example, active Robert Morris students in the Bachelor’s of Business Administration Program receive benefits like waived application fees and, if accepted, preferred tuition rates. Learn more about our Chicago academic partnerships. Many of our faculty members are active practitioners and leaders in their fields of expertise, bringing a wealth of first-hand insights into the classroom. By dedicating themselves to the success of our students, they have helped build and maintain some of the most academically rigorous psychology-based programs in the country.